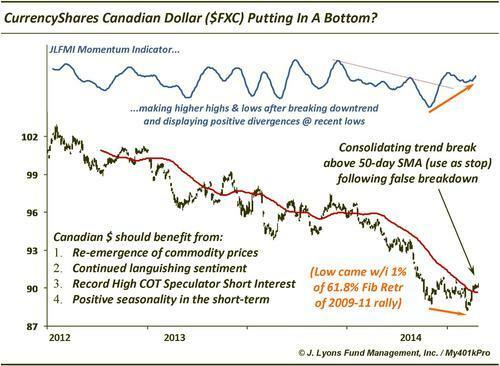 ChOTD-4/4/14 Canadian Dollar ($FXC) Putting In A Bottom? Following the Australian Dollar’s example (up 2% since our 2/19 post), the CurrencyShares Canadian Dollar ($FXC) may be in a bottoming process. 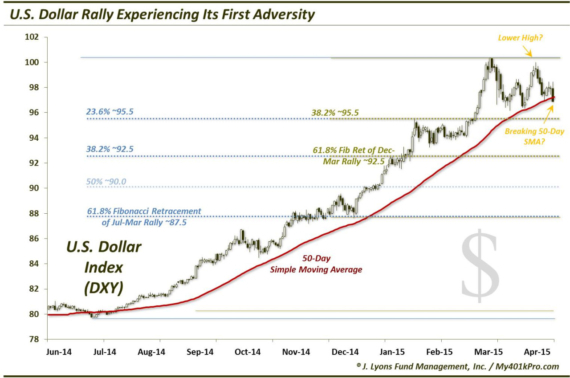 After a false breakdown in mid-March (which bottomed within 1% of the 61.8% Fibonacci retracement of the 2009-2011 rally), FXC has rallied above the 50-day SMA and is consolidating prior to a potential further move higher. Importantly, momentum diverged positively during the false breakdown and has now broken its downtrend and made a higher high. Add in a resurgence in commodity prices this year, positive near-term seasonality and historic bearish sentiment and this short-term bottom could evolve into a longer-term turn.